University Park Country Club was designed by world-renowned golf course architect, Ron Garl. Known for his innovative routings and true to his philosophy that a course should "sit softly on the land," Mr. Garl has set a unique standard for environmentally friendly projects that maximize and enhance the land's natural characteristics. 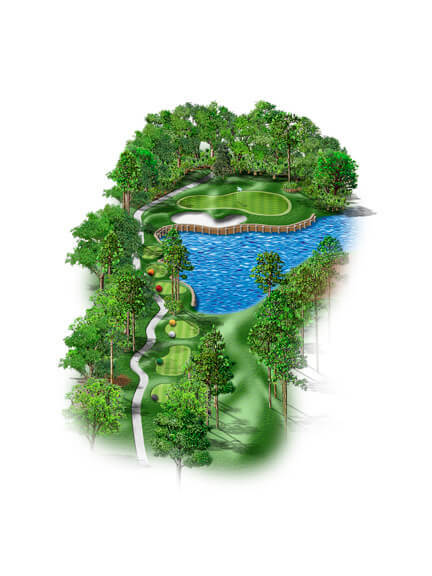 At University Park Country Club, a classic design concept was added which makes strategy and shot making a priority. Shortish par 4, just hit an easy 3 wood off the tee left middle of the fairway to leave yourself a mid to short iron into a mid size round green. Par 4 - Favor the left side of the fairway off the tee. Great birdie opportunity. Note the small pin indicators to determine front pin (low flag), middle pin (center flag), or back pin (high flag) on each hole. A short, beautifully shaped opener that requires an accurate tee shot and sets the tone for this front nine! Aim at the 150 yard marker and commit to hitting a straight drive! On the approach you must avoid the waste bunker to the right of the green as statistically only 9% of golfers make a sand save on this hole. Finding the middle of the green will offer you a good birdie opportunity on this comfortable opener. Reachable par 5, so go for it with driver off the tee to give yourself a chance to hit the green. If you go for it favor the right side of the long narrow green because the left side is protected by a large deep bunker and lake. Wonderful risk/reward hole. A great tee shot enables the long hitter to attempt making the green in 2. Otherwise, position second shot within 60-80 yards out to maximize your third shot and to avoid the water hazard guarding the left front of the green. A well struck drive off the platinum tee sets up an opportunity at hitting this 440-yard par 5 in two shots. A precise second shot is required as the narrow green is protected by water on the left that you cannot see from the fairway. This hole bottle necks as you get closer to the green so players laying up should not get greedy and lay back more than one might think. This green angles from the front right towards the back left so take more club when the pin is back left and less club when attacking a front right pin position. Top notch strategy created by a genius designer! Good par 4. Try to hit a fade off the tee to leave yourself with a mid to long iron on to a well protected green. 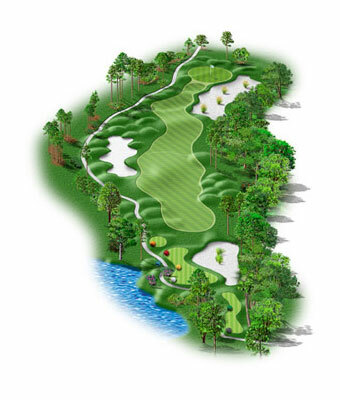 Par 4 - A slight dog leg right, a left center tee shot will give you best view of the green. Large trees guard the right side of the fairway and the small grove 50 yards short of the green can limit shot options. This slight dog leg right, handicap 1, should not be underestimated and often a bogey here is a good score. The fairway slopes towards the right and golfers who try to cut the corner are usually either blocked by trees on their second shot or find themselves hunting for their ball right of the cart path. The smart play from the tee is to aim at the bunker and fade the ball back into the fairway. Only 7% of golfers find this green in regulation, so don’t be alarmed if you find yourself chipping and putting for a par! Tricky par 4. Take a fairway wood or hybrid and aim at the fairway bunker on the left, from there you have a clear shot in to an elevated green(take one extra club). Par 4 - Consider leaving the driver in the bag and choose your straightest club! Take enough club to this raised green and try to stay away from the waste bunker just short and right of the green. No bailout here! This is another tee shot that requires a full commitment to the narrow target presented. The fairway tends to feed to the right and any drive that is pushed will have the second shot blocked by the big tree. A shortish 345 yards from the Platinum means a fairway wood or rescue club might be the safest option off the tee. Finding the fairway always allows for a good birdie opportunity. Great par 3. Ignore the water and huge bunker and knock it on the wide shallow green, two putt and run to the next hole. 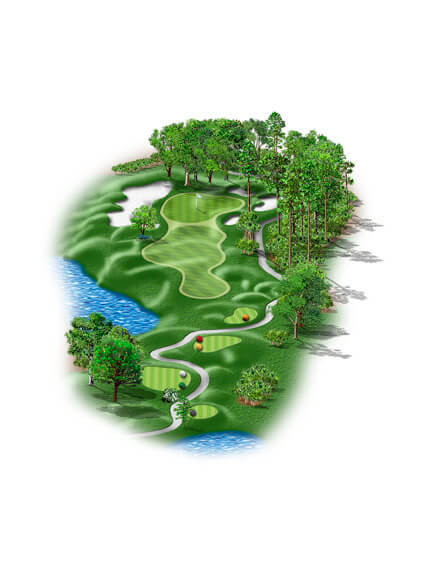 University Park’s signature hole, #5 requires a precise club selection. Take an extra club to carry the lake and do your best to focus on your shot instead of the beauty all around you. 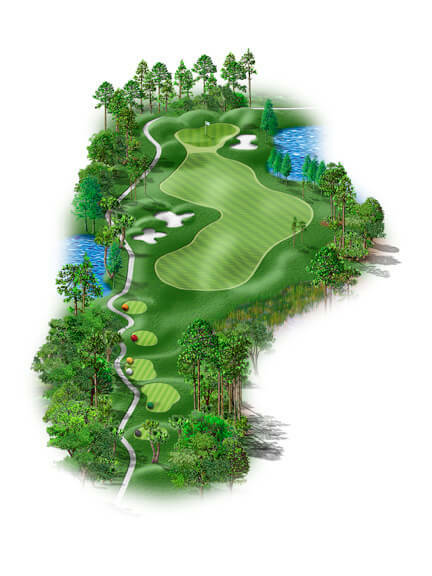 If you walk away with a 2 on this hole, you have “mastered” one of the best holes in Florida. Drinks anyone? This is our most popular par 3 and signature hole on the course. Having the correct yardage is a must. Take one extra club to avoid the magnetic front bunker and make sure to check the wind direction before you tee off. The middle of the green is always a good play! 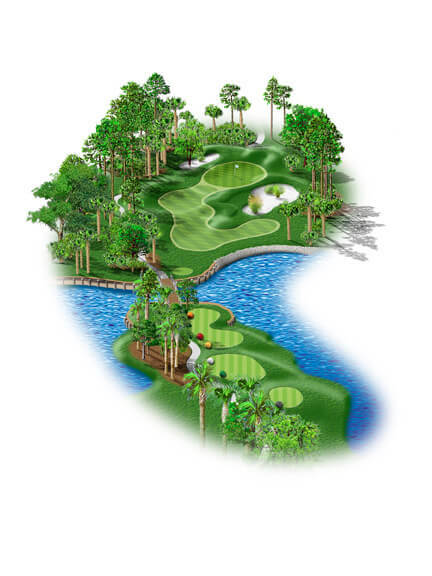 Enjoy the scenery and beauty of this wonderful par 3. Maybe the most demanding par 4 on the course. Take driver at the left edge of the fairway bunker on the right and don’t be surprised if you still have 200+ yard for your second shot. Dog leg left, the straighter and longer you hit your drive, the better your birdie chances will be. Choosing less club off of the tee though will guarantee central positioning, and will keep you out of the large fairway bunker. Arguably the best driving hole on the course! Aim at the left side of the bunker and draw the ball. The second shot expresses the natural beauty of the course, but stay focused and leave your approach shot short of the pin. Statistically you should get up and down if you leave yourself just short of the green. My favorite hole on the course! Longer par 5, stay down the right middle of the fairway to leave yourself with a straight in shot for your 3rd no matter where they stick the pin, 5 is a good score. Slight dog leg left, wonderful chance for birdie. Watch the wind, and the green breaks toward the boulevard more than you think. You will need a very well struck tee shot to potentially allow you the slightest chance to go for the green in two, but be careful as the green is well protected by a bunker and a tree on the left side. On the layup, make sure to favor the right side of the fairway as this allows for the correct angle in the approach. Pay attention to where the pin is located on this sloped green otherwise a tricky putt may follow. Well bunkered par 3, don’t let the lack of water let you fall asleep, a missed tee shot will leave you with a bogey or worse. 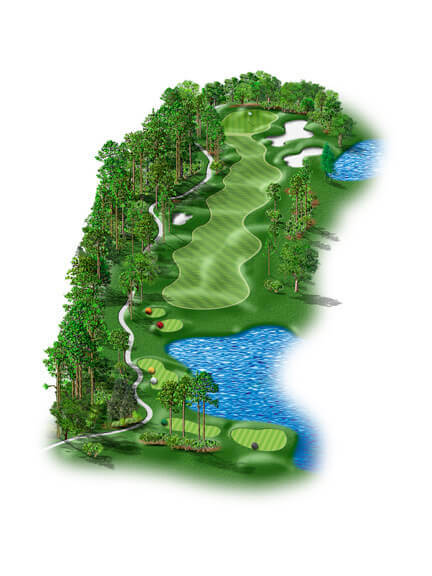 Par 3 - This hole seems to play slightly longer than the yardage, be careful not to miss short right of the green into the guarding bunker and palmetto group. Again, putts break toward the boulevard. This hole features a beautiful green surrounded by bunkers. Avoid going right. If you are long here, three putts are common. The green has some wonderfully subtle undulations that make putting both difficult and a lot of fun. Regardless of pin placement, the smart play is to the front center of the green. Good par 4, driving area can get very narrow for the longer hitters, second shot here is where you will sort out the golfers in the group. Left center tee shots must carry second shots over the entire green side hazard. Tee shots from the right center, must carry over a small tree. Golf course designer Ron Garl made an eagle 2 on this hole on opening day, holing out an 8 iron! Although the tee shot seems straightforward, accuracy is paramount from the tee on this hole and finding the fairway is a must. In the fairway looking towards the green you will be awed by a daunting approach over water, but don’t be suckered in by a back left pin, aim for the center of the green and 2 putts will do the job on this spectacular hole. Shorter hitters should consider laying up short of the green and to the right in order to avoid the water hazard! Short par 4, driving area opens up to the right past the trees. Your second shot is all carry so any miss at all will leave you with a tough bunker shot. 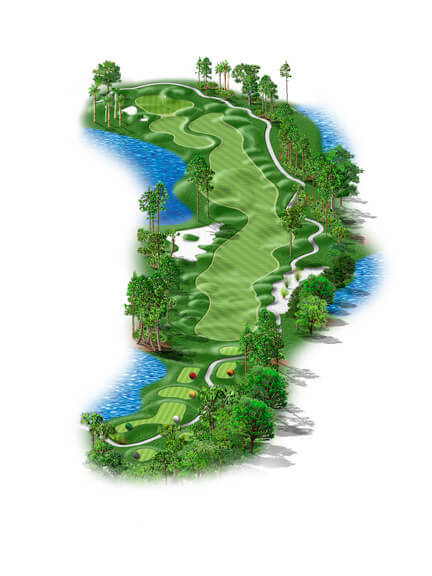 Par 4 – Fairway wood or hybrid will position drive short of the right side water hazard. Approach shot must carry the large front bunker, but there is room for a safety layup on the left side. Left side of green breaks left - right side of green breaks right. 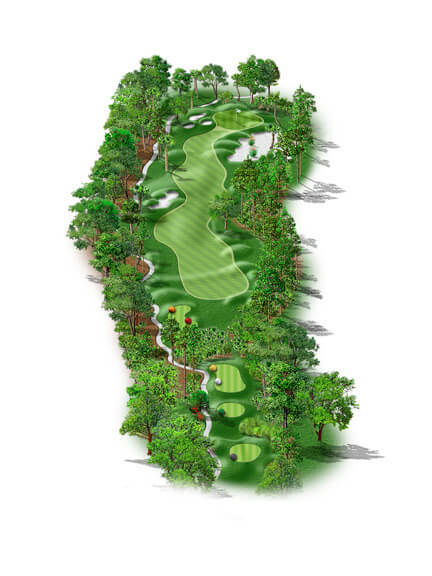 This visually stunning hole will certainly raise a true golfer’s heart rate, but it does have a bite and a premium should be on finding the fairway! An accurate drive should leave you a medium or short iron into a very wide green. Shorter hitters should avoid the right-side from the tee but the fairway does open up on the right side for the longer hitter. Club selection is important on the approach so check the wind direction coming off the lake, but a medium to short iron in hand should mean a good birdie opportunity. Golfers are well advised to stay below the pin on the green! Tough par 3, if you’re not confident your best option is to play 20 yards short and left, chip it up and have a go for your par putt, with bogey at worse. Par 3 - Carry your tee shot over a right front waste bunker. Green breaks from right to left, so ideally a left to right tee shot will best hold the green. 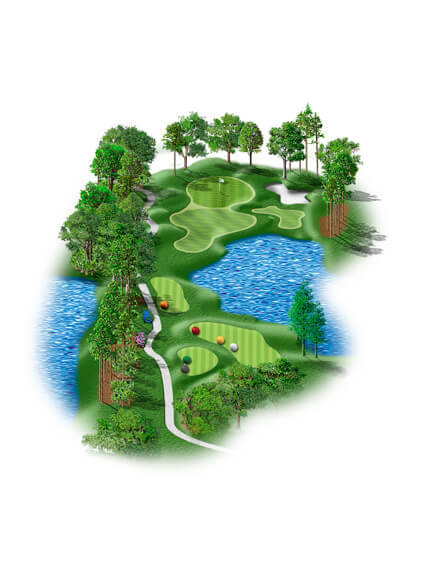 An all carry longish Par 3, so take an extra club and shoot for the middle of the green. The tee shot requires a longer carry over the waste bunker if you are shooting to the right side of the green. The well-defended green slopes from right to left and is more receptive to a left to right ball flight. The safe play here is short of the green and left, where any up and down for Par will be a great score on yet another masterful Par 3! Shorter par 5, fairly generous landing area, and no real trouble approaching the green, except stay away from the very deep pot bunker just short left of the" green. Par 5 - If the wind is at your back, this is a great chance to “Go for it”. For most, the best approach is from center or right center, giving you a great chance for birdie. This reachable par 5 is a good birdie hole that requires a 240+ yard drive to warrant a go at the green. Shorter hitters should play to the right side of the fairway when laying up as to avoid the water on the left and have a good view of the green on the approach shot. Avoid going long if the pin is located at the back of the green as you may find yourself faced with a tricky chip shot out of the thick Bermuda! The easier of the two par fives on this nine offers a good chance at birdie. 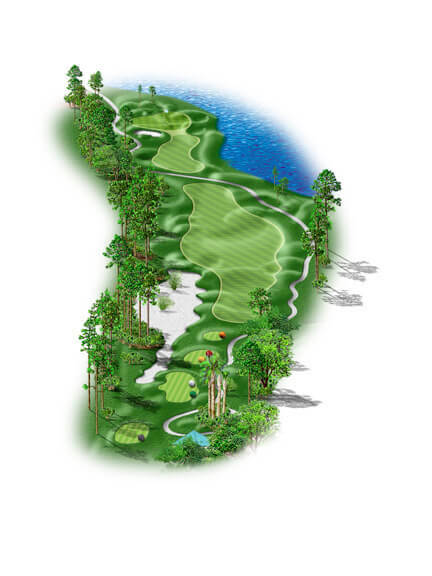 Dogleg right par 4, driver or fairway wood both leave you with a short iron into a fairly large green, stay away from the waste area off the tee on the right. Par 4 - Best Par 4 birdie chance on this 9. Long hitters may consider cutting the right corner on this dogleg, but staying out of the long right side waste bunker would be well advised. The longer the tee shot on this slight dogleg, the wider the fairway becomes, especially on the left side. There is a waste bunker down the entire right side of the hole that needs to be avoided. A short to medium iron will reward a good drive, but if the pin is tucked left, hit to the middle of the green and avoid the green side bunker. 22% of Golfers find this green in regulation and average 1.9 putts, so a birdie here is certainly on the cards. Tough par 5, keep your tee shot to the left away from the bunkers, play smart on your second shot to leave about 100 yards for your third, much easier trying to one putt birdie than going for it in 2. 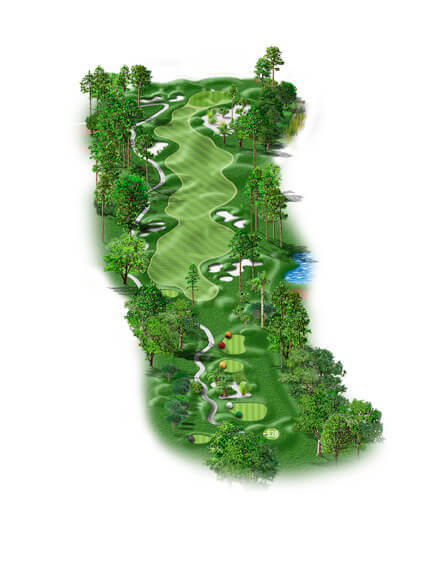 Par 5 – Third birdie hole in a row, the second shot is guarded by bunkers on each side. Try to avoid having the tough shot out of the waste bunker short and right of the green. Stay BELOW the hole! An excellent driving hole and here the longer hitter can take it over the right side fairway bunker. Once in the fairway, the wise play is to lay up between 70-90 yards short of the green, as this eliminates any risk and still offers a very good birdie opportunity. On the approach shot beware of the front right pin position as many balls aimed here end up in the waste bunker that protects the front right part of this green. Players par 4, be careful, don’t try to hit your tee shot any closer than 140 yards out from the green, then make sure you have plenty of club, a little long is much better than short. 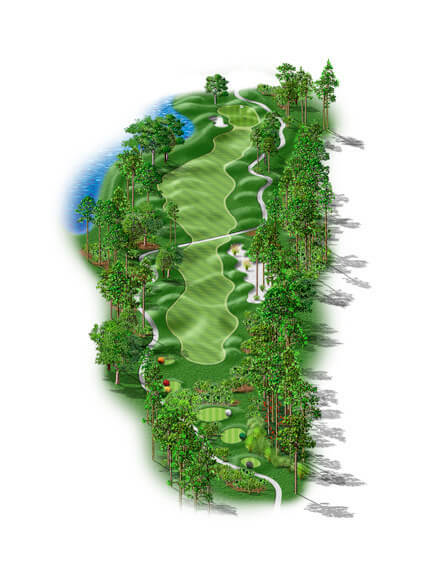 Par 4 – Since you cannot see the hazard from the tee, consider laying up only to the 150 area. Take enough club to carry the left front bunker onto this large green. A wide landing area from the tee but anything longer than the 150 yard marker from the tee could find you in the water that protects the right side of the fairway, which cannot be seen from the tee box. The longer hitter will need to play a draw from this tee. Once in the fairway a solid approach shot to the middle of the green and a 2-putt par here is a great score. Make sure to use enough club on the approach as the majority of shots land short of the green and you must avoid the bunker protecting the front left part of the green. F.Y.I. 44% of golfers that play this hole make a double bogey or worse so a par here is an excellent score! 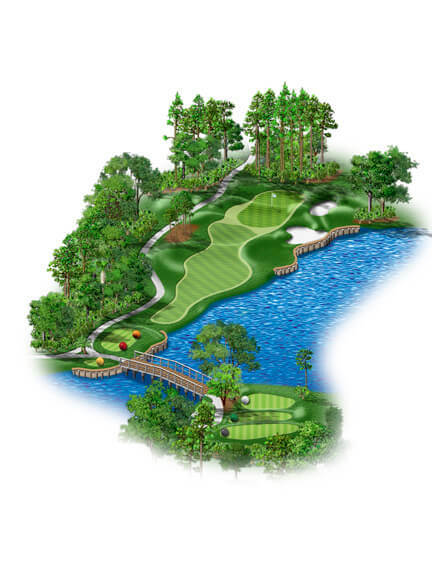 Beautiful par 3, cross the bridge to an elevated tee, the green is also elevated, very long and skinny. Favor the left side of the green, the deep green side bunker is no place to be. 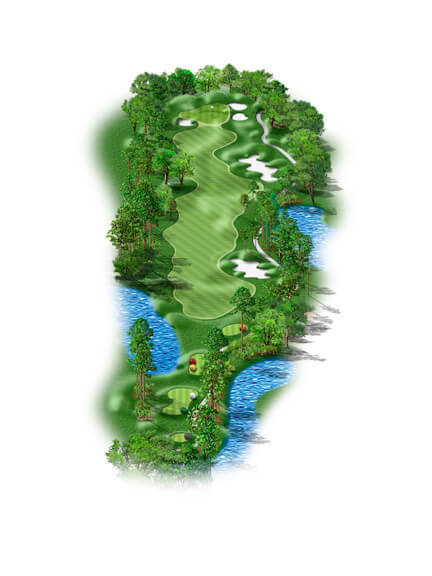 Par 3 – My favorite hole at University Park, choosing the right club for this multi-level green is tricky. Watch the wind, avoid the deep right front bunker, and know there is room short left for the safer approach. Here is a gem of a par 3 that can be kind and offers many birdies, but can pick you up by the collar and shake you in heartbeat too! To the right is a deep bunker and water. Miss left and there is a good chance you may be headed back to the tee! Aim at the middle of the green no matter where the pin is situated and if you do miss then short left is the best bailout area. Par here is a good score but don’t be surprised if a well struck iron shot leaves you with a great chance at birdie on this incredibly interesting and fun hole. Birdieable par 4, if you’re going down the right side don’t go too far, a lot more room on the left. Take an extra club to the green to avoid the front bunker and then make the putt. 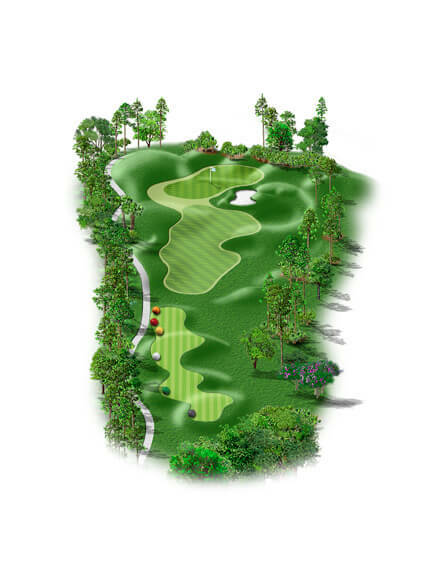 Par 4 – A right center tee shot sets up a 150 yard approach over a large protecting front bunker. Get to the correct level to maximize birdie opportunities. I have so much respect for this hole as it seems to play differently each time I play it! Although the tee shot seems straightforward, accuracy is paramount and some extra yardage will certainly help on this hole. A well placed drive on the left side of the fairway will leave an “easier” approach up the length of the green. Take an extra club on the uphill second shot and avoid the large, beautifully shaped, green side bunker. Par 4 with options, for the longest hitters take it left over the bunkers to leave wedge in, for the rest of us keep right of the bunkers off the tee and then make sure you don’t go long left of the green otherwise you’ll be looking at double bogey. 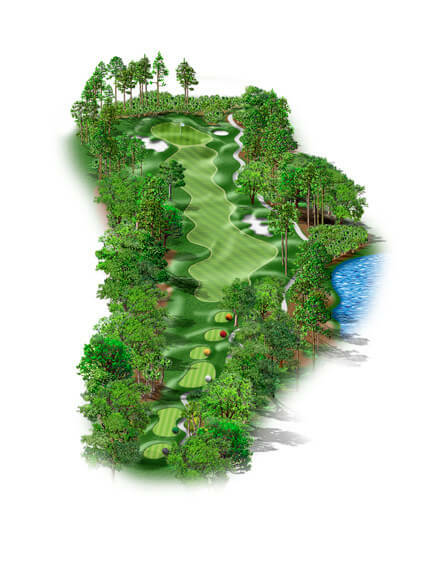 Par 4 – Beautiful and challenging, longest hitters may choose hybrid to avoid the right hazard at the 140 yard mark. Wrap-around bunker guards the right front of the green. Short left is more preferable than long left! Another accurate tee shot is required on this hole! Avoid the right bunkers as this will leave you a difficult approach over water. The green is open slightly on the front left as it moves back and to the right. Avoid hitting your approach shot long and left. A par on the final hole is well earned and a great way to finish a round on what must be the best inland course in the area! 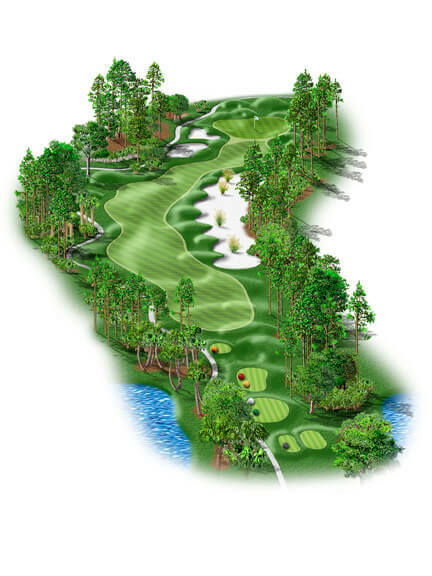 Par 5 with teeth, only the very longest hitter will come close to reaching this par 5, avoid the fairway bunkers, knock it on the green in regulation and 5 is a good score. 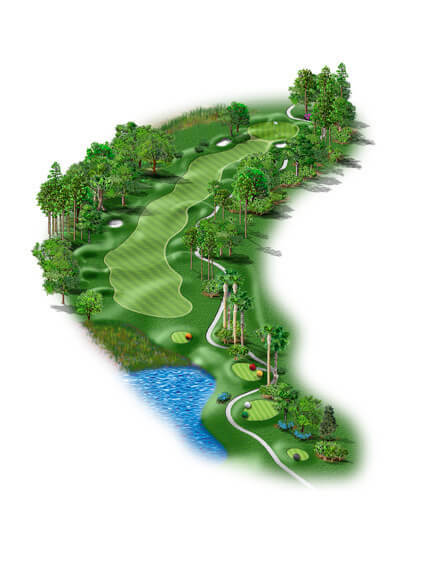 Par 5 – After a precise tee shot, the second shot layup area is quite generous. Aim your short third shot onto the correct level. Stay below the hole as the green breaks from back to front. Avoid the fairway bunker to the right as this trap will make reaching the green in three shots very difficult. A good lay-up is imperative and you will want to get your second shot past the tree that sits just off the fairway on the left! Your approach shot needs to be short of the pin on this severe back to front sloping green. Very few golfers will be hitting this green in two shots and a par here is a very good score! 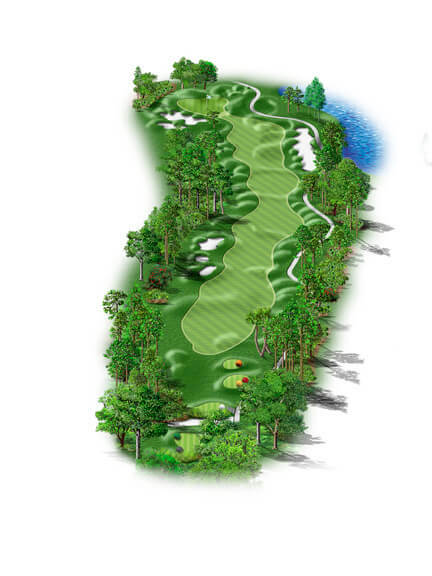 Small dogleg par 4, take driver off the tee down the middle then turn left and knock it on the wide open green. 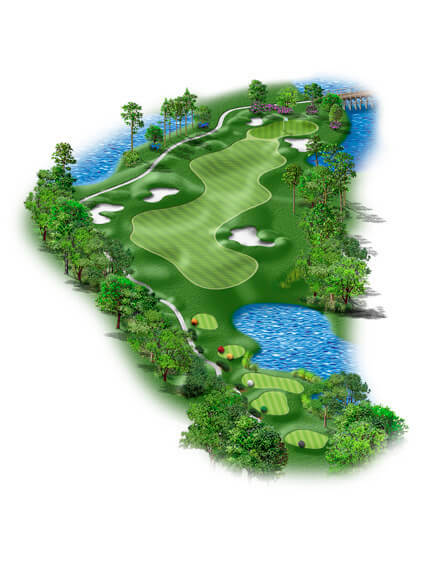 Par 4 – Another “Go for it” hole! 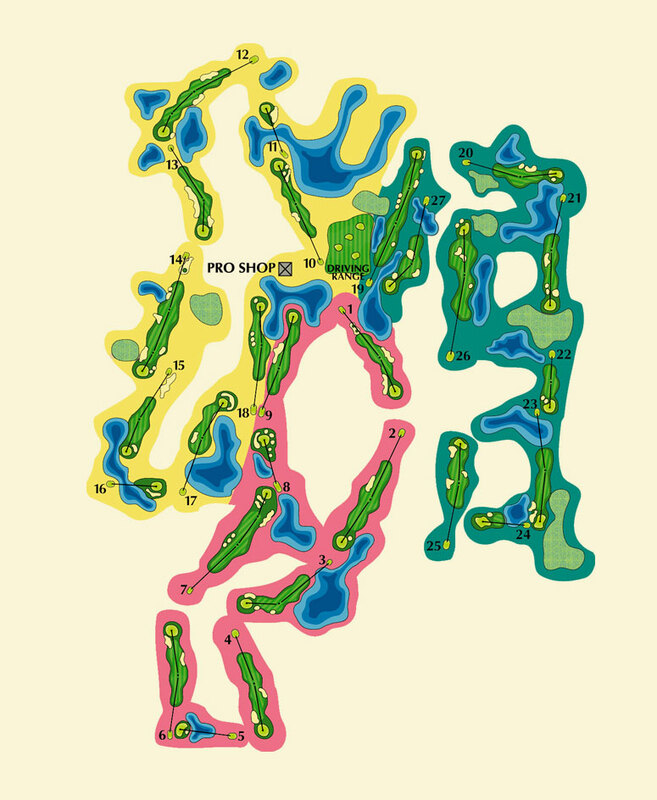 Tee off right center and realize the small mound in the center of the green affects all approaches and putts. Left side goes left, right side goes right, front falls forward. Long hitters can go ahead and take it over the two fairway bunkers on the left, from the tee, and leave short approach in for the second shot! If not, play to the right and you will still have a short to medium approach in for your second. Warning…if the pin is at the back of the green, do not go long, as you will be faced with either a difficult putt or an impossible chip! Long par 4, hit all you’ve got keeping it left of the fairway bunker then thread it between the two greenside bunkers onto the green. 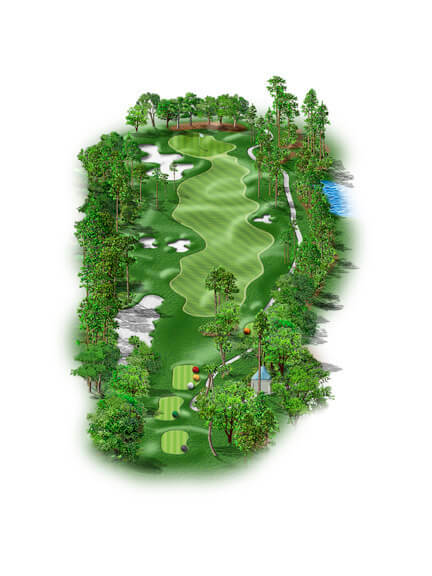 Par 4 – Stay left center off tee, then weave your way through two bunkers toward green – left one is 50 yards short of green, the other guards the right front. Congratulate yourself with a well-earned par. Avoid the fairway bunker to the right at all costs on yet another excellent driving hole! A good drive will leave you with a long second shot. 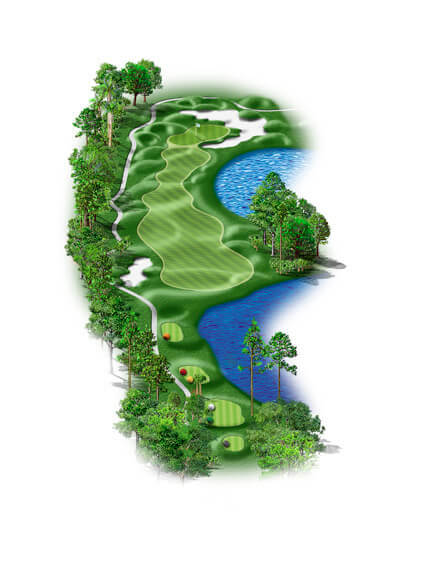 Aim for the left part of the green and if you miss, short left of this green is not a bad play! The green on this long par 4 is guarded by a deep fronting bunker to the right and sand saves from there are scarce. A par on this hole is certainly a confidence booster! Par 3, make sure you hit your tee shot onto the correct tier otherwise you’ll be looking at a quick 3 putt. 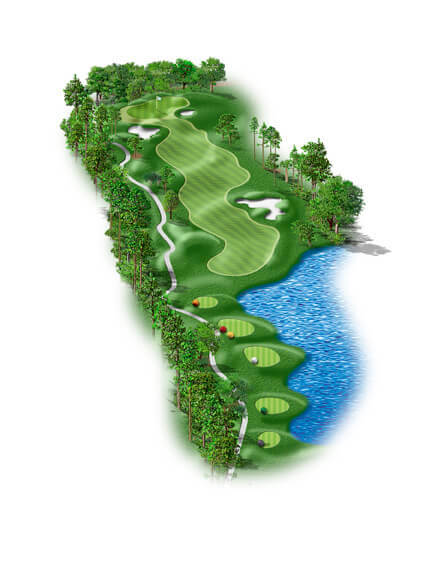 Par 3 – Tee off toward left center, avoiding the right bunker. Large green presents multi-levels. Club selection is key, you do not want a downhill putt! A two tiered green that sets up to receive a well struck fade shot. At least one extra club will be needed from the tee to land on the back shelf. 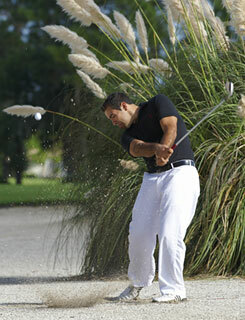 Avoid the bunker right as this is a very difficult sand save. A good play is to aim at the left side of the green and let your fade do the work. Imagination and a deft putting touch is required on this green! Longer par 4, hit a great drive to still leave you 200+ yards in, then favor the left side of the green for a much easier birdie putt. 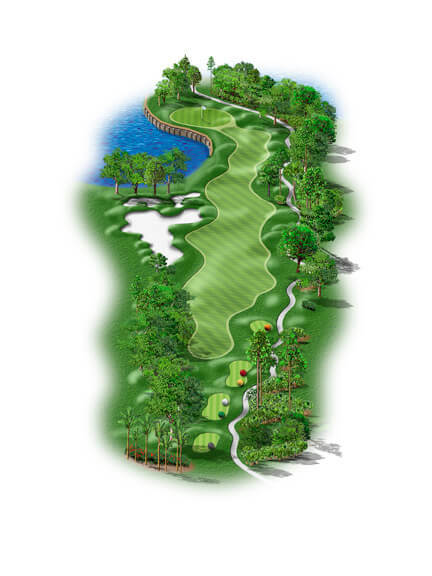 Par 4 – This hole is protected on the entire right side. Stay center to left center, and approach shots and putts break from right to left. Certainly one of the toughest holes on the entire course and the toughest on this nine! This long par 4 requires a tee shot down middle avoiding the three pal meadow bushes to the right that swallow many golf balls. A good tee-shot should leave you between 180 and 220 yards to the green. Aim for the middle of the green and avoid the bunkers to the right as they are set back from this difficult green leaving you a very tough sand shot if you miss here. Take your time reading putts on this complex undulating green! Easy par 3, finally you can leave the woods in the bag, mid iron into an accepting green, enjoy the break. 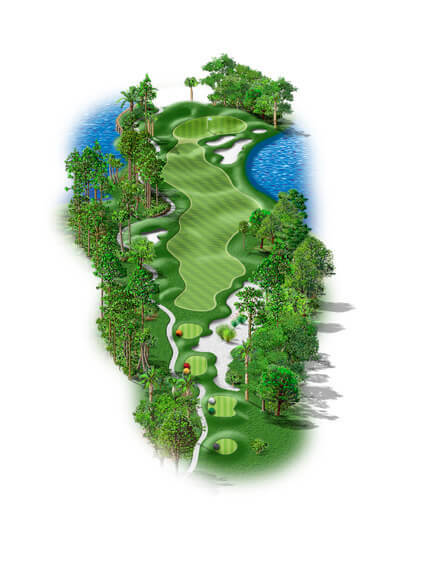 Par 3 – This picturesque hole requires a right center tee shot, as the green breaks from right to left. Greenside right is safe, but as you will notice, there is very little room for error to the left. A scenic par 3 that requires an extra club from the tee the middle of the green here is a good target. The bailout area here is short of the green, so if you miss-hit your tee shot while admiring the beauty around you all will be forgiven with a good up and down. Make sure to read the green twice as there is more slope than you think! Deceptive par 4, take drive at the bunkers on the right and try a little fade, longish second shot into a green well tilted from back to front, don’t leave yourself with a down hill putt. 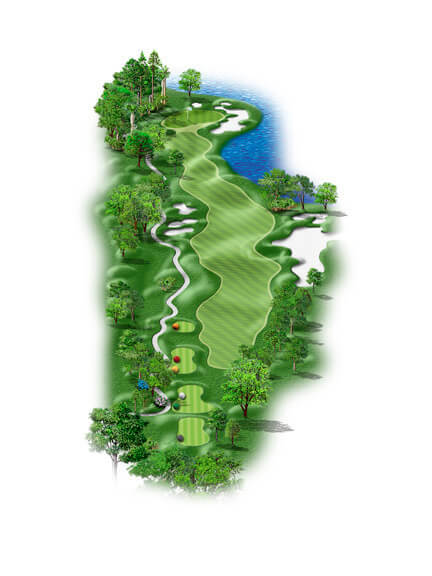 Par 4 – The final 3 holes on this 9 are true birdie chances. A left to right tee shot will avoid the right tree protecting the tee as well as the left fairway bunker. Land on the front third of this green to stay on offense. A good drive down the right side of this wide fairway will set you up for a short approach shot into the green. Make sure to keep the approach shot short of the pin as the green has a severe slope from back to front. Avoid the back left part of the green when the pin is located on the front right! Short par 5, favor the left side of the fairway, then take it over the three fairway bunkers 100 yards short of the green to give yourself a real birdie opportunity. Par 5 – Stay central off the tee to keep all options open. The second shot opens up to a divided left or right fairway, but going straight over the 3 bunkers in the center of the fairway proves to be risky and rewarding! Eagle is a possibility! 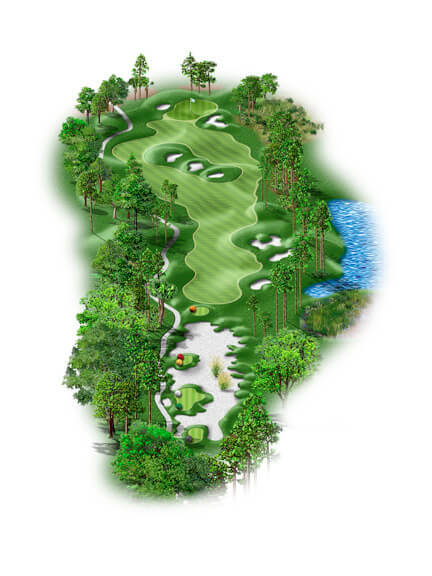 Statistically this par 5 will offer you one of the best birdie opportunities on the course but the hole needs to be treated with respect. Avoid the fairway bunkers to the right and a well struck drive will offer the longer hitter the chance to go for the green in two shots. If in doubt lay up to the left of the three fairway bunkers as this offers the best view of the pin placement. Be aware of the downhill slope when putting to a back right pin placement! Dogleg right par 4, keep it left of the one fairway bunker on the right to leave your self with a short iron into a shallowish well protected green, finish in style with a birdie. Par 4 – Most will aim just left of the right bunker. Bombers can fly right over it, with just a flip sand wedge to the green over the right front bunker. It’s a smaller green than most; the front half of the green breaks to the front, the back half of the green breaks to the right. ‘Bombs Away’ – Here a well struck drive over the right bunker will give some added roll and offer a short approach shot into this shallow yet receptive green. Avoid the bunkers that are set back from the green as you will be faced with a very tough up and down. A well struck approach shot will give you a good birdie opportunity on this hole, the shortest par 4 on this nine!